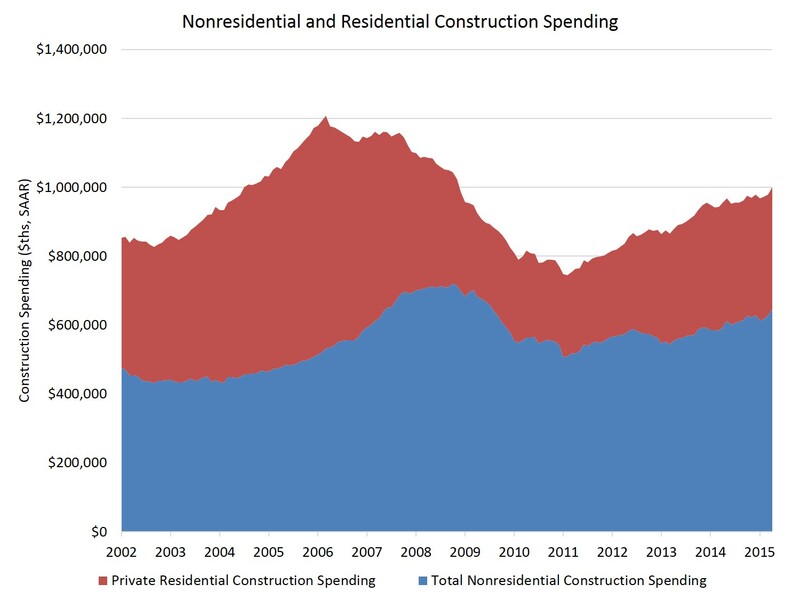 NAHB analysis of Census construction spending data finds that the pace of residential construction spending improved on both a monthly and year-over-year basis for April. For the month, the seasonally adjusted annual rate of single-family construction spending was $206 billion, up 1.6% from March. The April rate of multifamily construction spending was $51 billion, 3.1% higher than March. 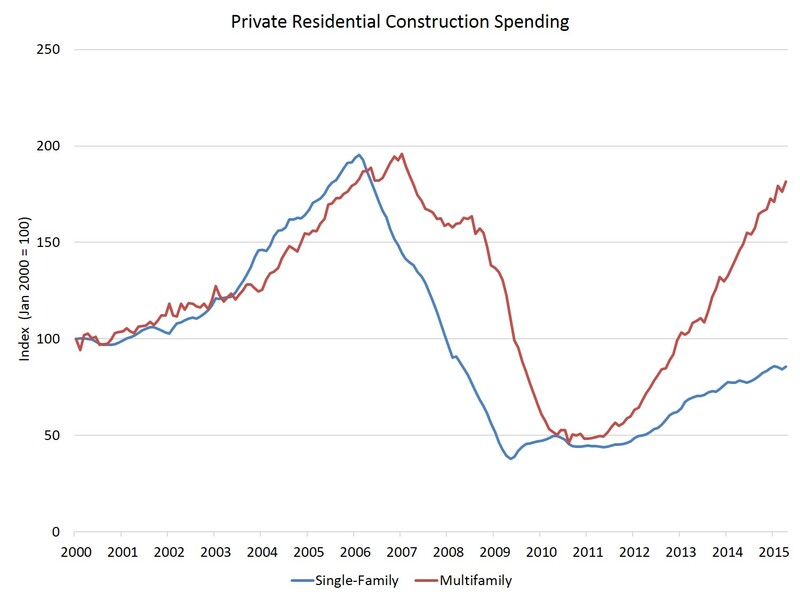 On a year-over-year basis, the pace of single-family construction spending was up more than 9% from April 2014, while multifamily spending was almost 25% higher. The Census construction data (indexed in the graph below, so that the January 2000 pace is equal to 100 for both variables) illustrate the degree to which multifamily spending is thus far leading the recovery for the residential construction sector. NAHB expects gains for multifamily to slow in 2015, while single-family construction increases. It is worth noting that the Census measure for total private residential construction spending shows a 2.1% year-over-year decline, despite annual gains for single-family and multifamily development. This decline is due to a significant decrease in the separate Census improvement category, which contrasts with other measures, including the NAHB Remodeling Market Index, which indicates strength for the home improvement sector. The rate of total nonresidential construction increased 3.2% in April and has now posted a nearly 9% year-over-year increase. The largest year-over-year gains for nonresidential construction spending have been experienced by the classes of manufacturing-related construction (52.9% gain), amusement/recreation (23.3%), and office (19.3%).